Don’t call Cherokee County a “hidden gem” or any other phrase implying that people are unfamiliar with its charms and assets. There are too many who know the truth. This north metro county is far from undiscovered. Over the past decade, the area has claimed the title of the region’s fastest growing. Population grew 19 percent between 2010 and 2018 from 214,346 to 254,500, according to an Atlanta Regional Commission study. Cherokee is and remains largely a bedroom community. Most people – about 78 percent of the workforce – travel elsewhere to earn a living. It’s a hard fact of life for economic developers, but one that is beginning to change. These days, local employment in service, retail and even industrial is up. 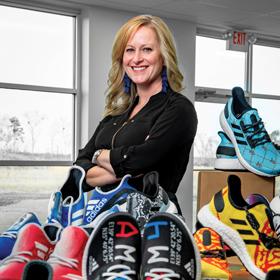 “The variety of industry that continues to locate to Cherokee County is a plus, because those are quality positions with excellent companies and those jobs are offered right here at home,” says Pamela Carnes, president and CEO of the Cherokee County Chamber of Commerce. Among the big wins was the recent opening of shoemaker adidas’ futuristic Speedfactory, a joint venture between adidas and OECHSLER Motion, which runs the manufacturing process. adidas’ line of sneakers and running shoes are designed and made at the 74,000-square-foot facility using robotic technology for textile manufacturing. This facility is just the second Speedfactory – the other is in Germany where OECHSLER is based. The plant, which has generated national attention, needed highly trained and capable workers to fill jobs such as engineers, technicians and stitchers. Cherokee was able to provide that kind of workforce, along with an accessible location. The company found the right building site at the Cherokee 75 Corporate Park in the county’s fast-growing southern area along with tax incentives, says Cherokee Office of Economic Development President Misti Martin. Cherokee is also home to Inalfa Roof Systems, supplier of panoramic sunroofs for the auto industry. With more than 1,000 workers, Inalfa is the largest employer in the county, says Martin. Cherokee is a big and diverse county. Here you find farms and cattle, lush forests and dirt roads. While some want to get away from it all and find peace and quiet on acreage, a growing number of residents – both young and old – are embracing a more urban experience. To attract companies and jobs, local officials realized they had to create a quality of life that would suit workers’ desire for retail and restaurants more like those found in urban areas – mixed-use development was the key, according to Martin. “We’ve done a lot from a planning standpoint to really encourage that mixed use,” she says. “We realized that the downtown areas [of our cities] have a lot of opportunity for mixed use. Local leaders say this once largely rural county has enjoyed sustained popularity due to the proximity to Atlanta’s northside and easy access to the city by interstate. It’s also a good place to start and raise a family, says Cherokee County Commission Chair L.B. “Buzz” Ahrens. The county has not been reluctant about investing in services ranging from schools to public safety. A thriving higher education sector, including private Reinhardt University and public Chattahoochee Technical College, means students can go from elementary school to a graduate degree without leaving the county, Carnes says. The county has won high ratings from regulatory agencies for its fire and law enforcement services. Its ISO (Insurance Service Office) rating of Class 2 puts it among the best in the nation. The sheriff’s office, 911 service and other government functions have also won national accreditation, according to Ahrens. Cherokee has spent money to build greenspaces, trails and parks that lend credence to the idea of quality of life, and plans are underway to develop a linear park and greenway system that connects across the county. There is an awareness here that concentrations of high-end mixed-use development make it easier to attract companies. Businesses like to relocate to areas that offer employees opportunities for shopping, entertainment and a general vibe that things are happening here. Finding new purposes for historic structures has been a key point in bringing that kind of mixed use to the county. Developers purchased the Mill On Etowah and are in the process of transforming the Canton Textile Mills, which operated from 1899 to 1981. The two projects combined represent 340,000 square feet of historic properties located on 30 acres along the Etowah River in downtown Canton being redeveloped. The project is one of several adaptive reuse efforts in the city. The old textile mill has a considerable amount of history and was once the biggest employer in town. The property also includes a half dozen other buildings. Among the first businesses to lease space is the county’s popular Reformation Brewery, which is moving its main warehouse and production facility to the mill and opening an adjoining taproom and events space this year, while keeping its new Woodstock taproom, as well. Along with a projected 46,000-square-foot marketplace, the Mill on Etowah will include a Thrive co-working office space, five restaurants and another 16,000 square feet to 20,000 square feet of retail. There also are plans for an outfitter to rent paddle boats and kayaks for the nearby Etowah River. The next phase will include about 250 loft apartments. Another re-purposing of historic structures can be found at Academy @ Main, a mixed-use development by The Harris Group on the corner of Main and Academy Streets in downtown Canton. Included is the renovation of the old Canton Elementary School and the Canton Textile Mills office building into restaurants, retail and office space. There’s also more to come. On the historic town square, the city aims to breathe new life into the 1930s-era Jones Building. This 42,000-square-foot structure was once a mercantile store that sold any and everything local folks needed. It’s a building with opportunity in this new era of adaptive reuse, and the city recently finished the first phase of getting it ready for possible sale to a private-sector developer for renovation. Suddenly Canton and other small cities with traditional downtowns across the county have become the place to be – for living, working and entertainment. The revitalization of city centers is a trend taking root throughout the county. In Ball Ground, a wave of redevelopment has been sparked by the attention generated during the 2015 filming of the motion picture American Made. The film, starring Tom Cruise, was shot in the city, which served as a substitute for a town in Arkansas. The attention brought new businesses, including the Burger Bus restaurant, which operates out of an antique trolley bus (AKA trackless trolley). The trolley once plied the streets of Atlanta carrying passengers during the middle decades of the 20th century. Since its 2015 opening, the renovated Burger Bus has become a dining destination with its vintage look and locally sourced Angus beef. The city also got good news when Chart Industries, a longtime corporate citizen, quietly moved their corporate headquarters from Ohio to Ball Ground. The company is a leading manufacturer of cryogenic equipment used in the liquid gas supply chain. “They already had several different divisions here from a manufacturing standpoint, but it’s a real vote of confidence when a company, an existing manufacturer, will bring their headquarters here,” says Martin. In South Cherokee, Woodstock was once a sleepy small town where nothing was open past 5 o’clock. “You could shoot a shotgun off and not hit anybody,” recalls Woodstock Mayor Donnie Henriques, a longtime resident. The city has certainly seen its share of the county’s growth. Between 1990 and 2000, Woodstock’s population doubled and then increased another 114 percent over the following decade. Over the past few years, it has evolved into a walkable city brimming with restaurants, shops and the type of mixed-use development that you might find in bigger cities. On a typical weekend, the streets are crowded with people and finding parking can be a challenge – as is getting a table at popular restaurants. The latest addition is a planned development at the corner of Arnold Mill Road and East Main Street. The city is set to acquire a plot of land long occupied by Morgan’s Ace Hardware. That venerable business is planning to move into new quarters outside of town, which opened up the prospect of an addition to the city’s already thriving downtown scene. Plans include a 100-room boutique hotel, 35,000 square feet of retail and 35,000 square feet of office space. The city already owns the other corner of the intersection, and this area is slated for redevelopment and the construction of a new Woodstock City Center that will include a municipal building, a parking deck to make it easier for visitors coming into the area and probably some retail as well, according to the mayor. In addition to its thriving downtown, Woodstock has become something of an entrepreneurial hub. The heart of this business-friendly town is a co-working and incubator space called The Circuit. Located on the Woodstock campus of Chattahoochee Technical College – the former Woodstock Elementary School – it offers space to work and access to resources aimed at making the startup process a little bit easier. The Circuit is open to Chattahoochee Tech students with the idea that they will have the opportunity to meet and perhaps work with local entrepreneurs. The campus is also the home of the county’s and city’s economic development offices – a prime point of contact for businesses. The space gave a software services startup called Black Airplane its start. A full-service website and app development company, the firm was acquired by Michael Caldwell, a former 3M executive, and his business partner David Leggett from its original owner. In less than two years, the company has grown from two people to 10 – and outgrown The Circuit as well. With customers such as Coca-Cola and International Hotel Group, the company has a firm foothold in the Fortune 500 world of enterprise clients. They’ve done this without benefit of downtown Atlanta offices. “We were big believers that this sort of ‘outside the perimeter’ approach to doing a tech company like this was a recipe for success that most weren’t trying,” says Caldwell, who lives in Woodstock and serves as the District 20 state representative. A considerable amount of the tech talent working in the city already lives in the suburbs and were getting tired of a daily commute that was “the worst part of work,” he says. That fact made it easier than he expected to recruit high-level talent for the company. The office is in Woodstock, and when they need to meet with clients they simply drive into Atlanta, he adds. Others are following its lead. Each week The Circuit hosts the local chapter of the Kauffman Foundation’s 1 Million Cups program. This national event is designed to educate, engage and connect entrepreneurs with talent, investment and support. The county’s steady growth has also made it a target for another growing industry – healthcare. Several years ago, Atlanta’s Northside Hospital bought R.T. Jones, Cherokee’s community hospital, with plans to replace an outdated 1960s-era facility. After investing more than $286 million into a new hospital on a new campus, it almost immediately began an expansion. The $43-million project added two new floors to the six-story building, Martin says. With more than 700 physicians and 2,000 employees, it is one of the county’s largest employers. The hospital is the culmination of a major move by Northside into the county that began with a medical office building, Northside Holly Springs Medical Campus, on Sixes Road. It soon added a second medical office building in Woodstock. Another well-known name in Atlanta healthcare, WellStar Health System, has also moved to serve patients in the county. It’s finishing up work on WellStar Cherokee Health Park, an $80-million facility on a 60-acre site in Holly Springs. It will serve as a one-stop-shop for patients, providing access to urgent care, physician offices, an imaging center, a sleep center, physical therapy, cardiac diagnostics and lab services. When finished, the park will mean about 125 physicians and staff will be working in the county, Martin says. From healthcare to education to an expanding job market, Cherokee is increasingly becoming an attractive place to live and work. Many have recognized its charms over the years, and those numbers are steadily increasing as it becomes a prime destination for a thriving metro region. For entrepreneur Lauren Bolden, success has literally been as easy as pie. You can see the results at the bakery and cafe called Pie Bar in downtown Woodstock. A few years ago, Lauren began baking and giving pies away to friends and coworkers. They were so good that she and her husband, Cody, started taking them to weekend farmers markets in Jasper, Marietta and other towns throughout the region. They sold well, and demand soon outstripped her capacity to produce the tasty treats on her own. The idea of a permanent location where the pies could be baked in larger quantities and sold directly to the public took root. The only question was where. “We found that among all the markets, Woodstock was the place that really supported local business and accepted their own,” says Bolden. In fact, after the couple graduated from college and started working – Lauren at the State Capital in Atlanta and Cody in construction in Pickens County – they settled in Woodstock as a good halfway point. They were already selling more pies in Woodstock than anywhere else. Besides, the city was well into its own renaissance, and downtown was providing fertile soil for small businesses. With the catchphrase “handcrafted pie for the masses,” Pie Bar opened on Main Street three years ago. It’s been thriving ever since, she says. The appetite for pie has been surprisingly insatiable. Customers come in during the week to order coffee and a slice from the half-dozen tasty and changing varieties on the menu. As the weekend rolls around, the number of whole pie orders increases. Pie Bar has grown along with Woodstock. It certainly helped that soon after the shop opened, the space next door was taken by MadLife Stage and Studios. The popular concert and event space ensured that a large number of people are in the area and might stop in for a slice before or after a performance. Pie Bar’s success might seem a bit surprising. Who would have guessed that so many customers would buy and eat pies – even pies this good – so often? She chalks it up to locals’ willingness to buy local.